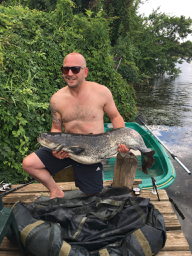 July 2017 : Rian caught this 23kg (50lb) catfish; a beauty! The river Lot flows all year. As such the carp and catfish are very muscular as they need to swim against the current – which can be strong. Because of this, the carp are STRONG fighters and a 20-30lb (10-15kg) carp will fight VERY HARD; be warned! 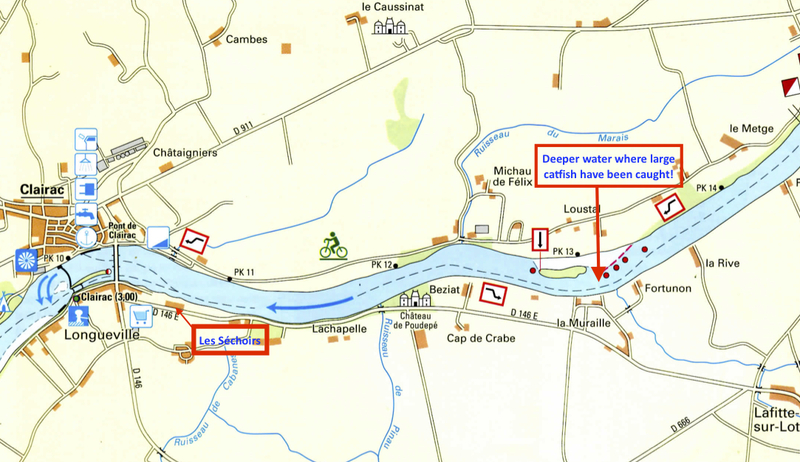 In terms of baits, the fish around les Séchoirs are plentiful and, as you can see from the profile (view here) you should probably fish within one of the two “channels”. If you use smaller baits you will inevitably catch copious quantities o f roach, bream, chubb and the indigenous Ide (cross between a bream and a roach). Using large boilies will usually attract only the larger fish so our guests often run three rods each with different baits to be sure to catch a good range of fish! News : August 2018, fishermen from the Netherlands discovered that catfish LOVE chicken liver! As a result they caught many good examples. However, the LARGEST was a catfish which was unfortunately lost. 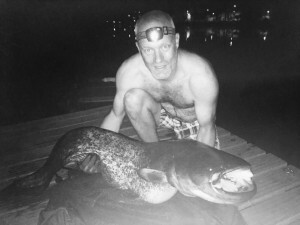 A 1.75mm thick (braid) hook length was suddenly cut through by a seriously large catfish. The fisherman (Raoul) was delighted with the fishing here (carp and catfish) but was annoyed that he lost what he was convinced was a MONSTER !! August 2017; a 77lb (35 kg) Catfish was safely landed at Les Séchoirs in early August 2017. To land the enormous fish, our guest had to use the rowing boat to play the fish more than 300 metres downstream. After more than one hour, he netted the fish and returned safely back. Great result! July 2017; a guest arrived and, shortly after arrival mid afternoon, was setting up his fishing gear. Within less than an hour, he was playing a large fish; it was a 36lb (16.3kg) Catfish. WONDERFUL ! 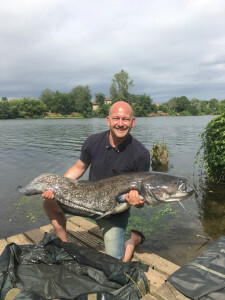 However, the next day, he caught a 23kg (50lb) catfish for which another bottle of “bubbly” was awarded! Late September 2016 : One of our Dutch fishermen slept out in his bivvy each night and had moderate success in catching carp and catfish. 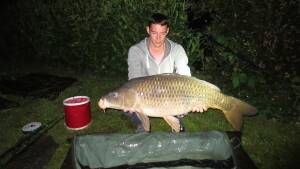 On his last night, he was playing what he believed was a small (less than 15lb / 7kg carp) when WHACK! The fish he was playing had been taken by a seriously large catfish. Unfortunately this catfish hadn’t been hooked. 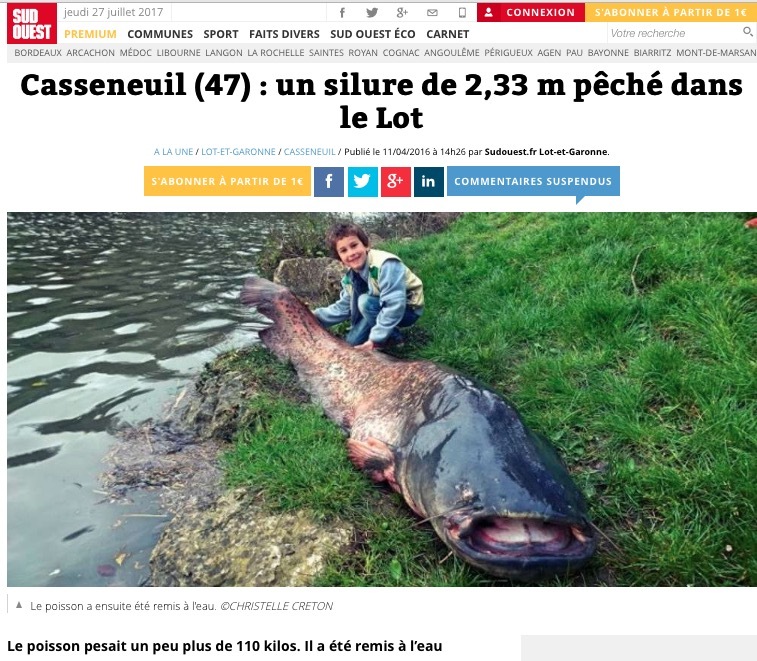 Our guest reeled in what remained of his carp; there was not much left of it …..
As he was leaving to return to the Netherlands, he said that he would be back; but this time he would focus on these LARGE catfish, possibly just upstream from Les Séchoirs where the depth is around 2 metres deeper! But are you ready to catch one this size ?!! !